The day of the eclipse has arrived: August 21, 2017. You’ve planned all year for this rare celestial event, organizing an entire two-week trip to the American Northwest around it. Your bus, which was originally scheduled to leave Portland, Oregon for the Willamette Valley at seven in the morning is now leaving at 5:30 to account for the massive influx of eclipse traffic in the area, so you awake in your Portland hotel room around 3:45 and walk through the city in the cold, dark morning to the pickup location. Once on the highway you quickly discover that the organizers’ fears were well founded as you find yourself stuck in gridlocked traffic, and you’re thankful that the tour operator chose to alter the itinerary from Salem to Aurora, half the distance from Portland. The trade-off is that you’ll only see 30 seconds of eclipse totality rather than 90 seconds, but you figure that 30 seconds is better than completely missing it while stuck inside a bus on the road. 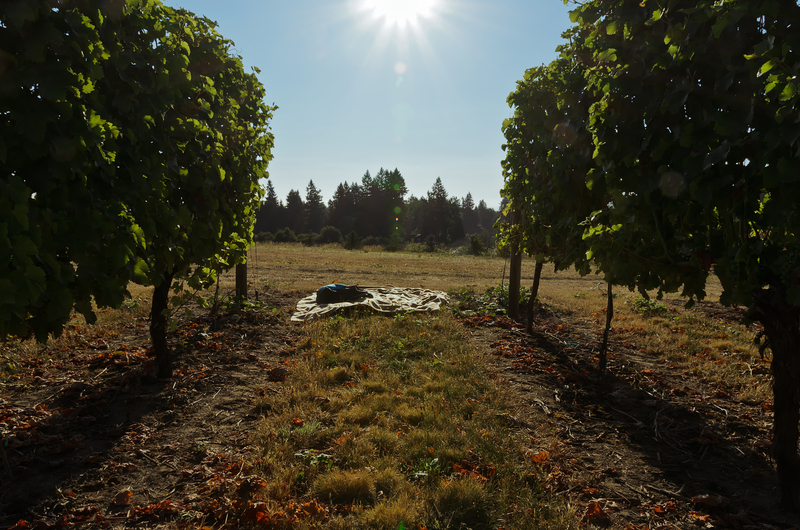 It takes the bus 90 minutes to drive 22 miles but you finally reach your destination: Aurora Colony Vineyards, a quiet, idyllic place for viewing an eclipse. You have a couple of hours to kill before it begins. In the meantime, your tour operator offers your group a chance to hop back on the bus and drive further south to a school, where you would be able to see 60 seconds of totality instead of 30. Most of the group chooses this option, but you and a few others elect to eschew further time on the road in favor of remaining behind to relax and view the eclipse in the peace and tranquility of the vineyard. So you grab a blanket and hike up into the vines, scoping out a nice private location to sit and watch. The eclipse begins and you don your viewing glasses. For a while not much has changed. 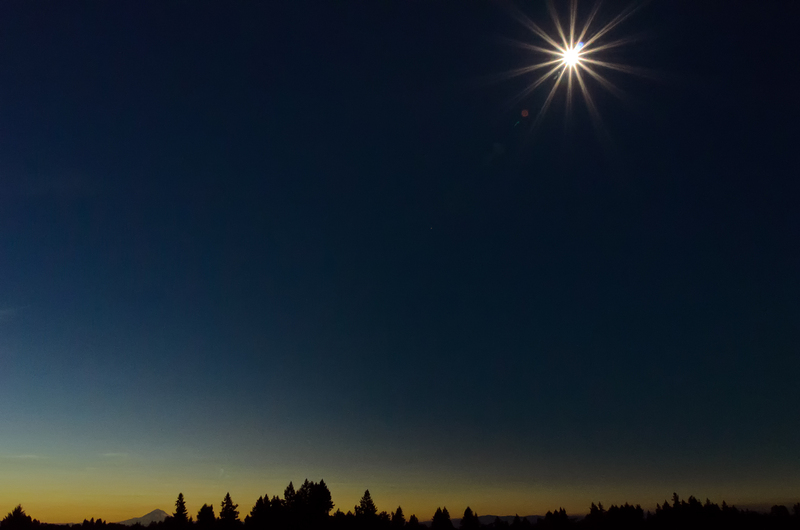 You can see the moon beginning to cover the sun through the glasses, but when you remove the glasses the sky appears as bright as usual–and will remain so for roughly an hour. The moon’s path across the sun is slow, so you alternate between removing your glasses to take some photos and putting the glasses back on to check the status of the eclipse. 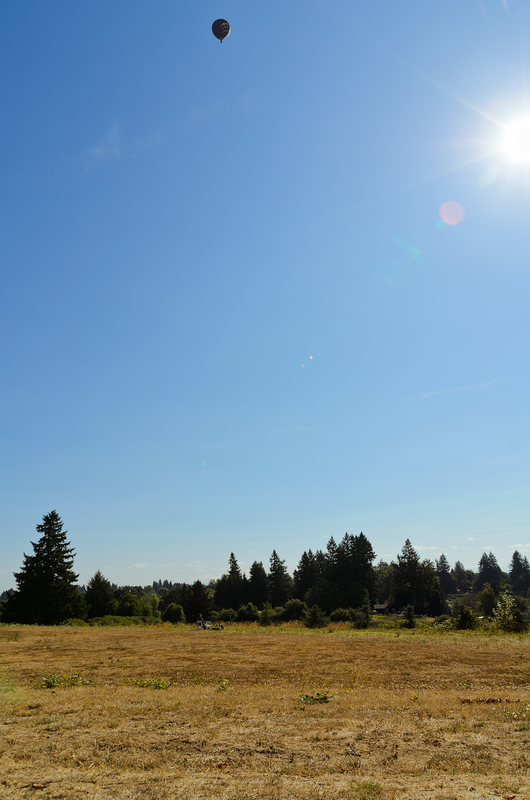 You watch in wonder as a hot air balloon circles the sun, partially jealous of the prime location of its passengers, but also thinking, “They better not block my view.” You’re reminded of the myth of Icarus. You take some time to call your wife back home in New Jersey while you wait for the ultimate show. Even with the sun half covered there’s not a noticeable difference in the level of daylight. Then it starts to get cooler. 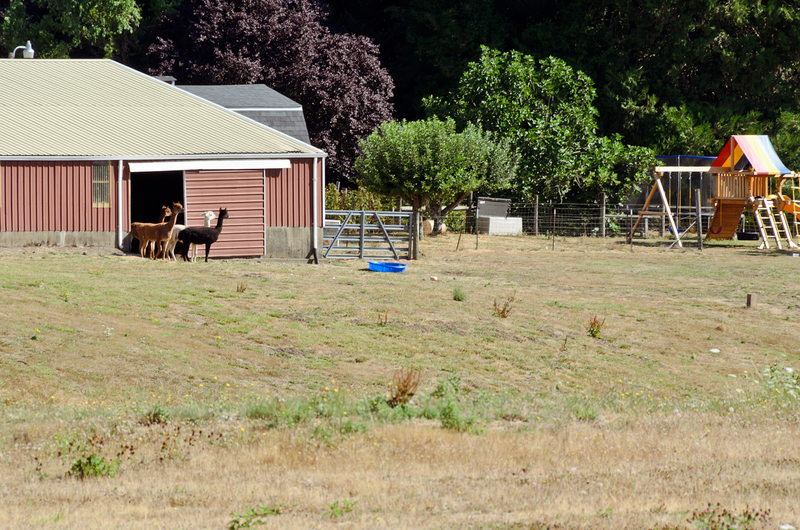 The farm animals know something is up. They hang out at the barn door, not sure what to make of this, afraid to venture too far from safety. Dogs in the area start barking like crazy. The air grows even colder and you throw on your jacket as the wind kicks up. The sky begins to darken as if the day is retiring to an early dusk. 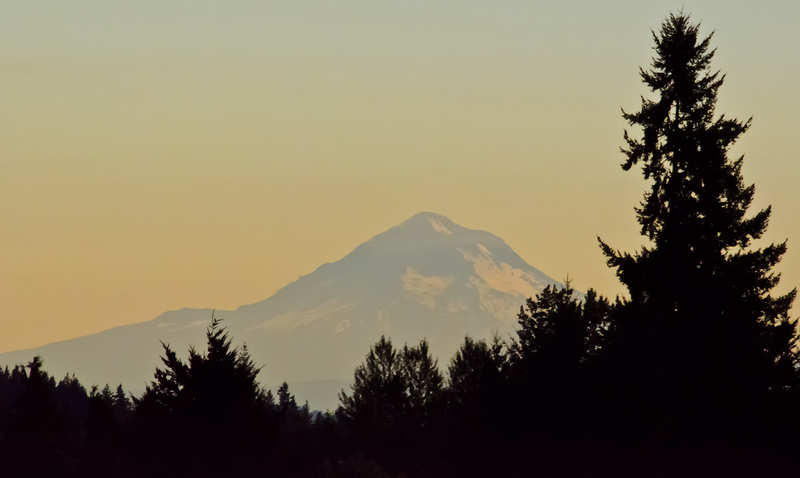 Mount Hood in the distance has become much more visible in the amber hue of the diminishing light. Still the air grows colder and it’s suddenly quiet, eerily so. The dogs have stopped barking, the birds no longer chirp. You keep alternating between ‘glasses on’ and ‘glasses off’ as the eclipse approaches totality. The others nearby start oohing and ahhing. At first you’re afraid to remove your glasses because of the horror stories you’ve been told about eye damage, despite knowing that it’s safe to remove them during totality. So you glance at other people to make sure their glasses are off and then you throw yours to the ground as you rise to your feet. You stare awestruck at something out of a science fiction film: a dark circle surrounded by a ring of purple fire, a glowing white diamond at its edge, all cast against a black sky. You are witnessing a total solar eclipse. You zoom in with your camera and snap a few quick photos that you know will never do justice to what your eyes are seeing. 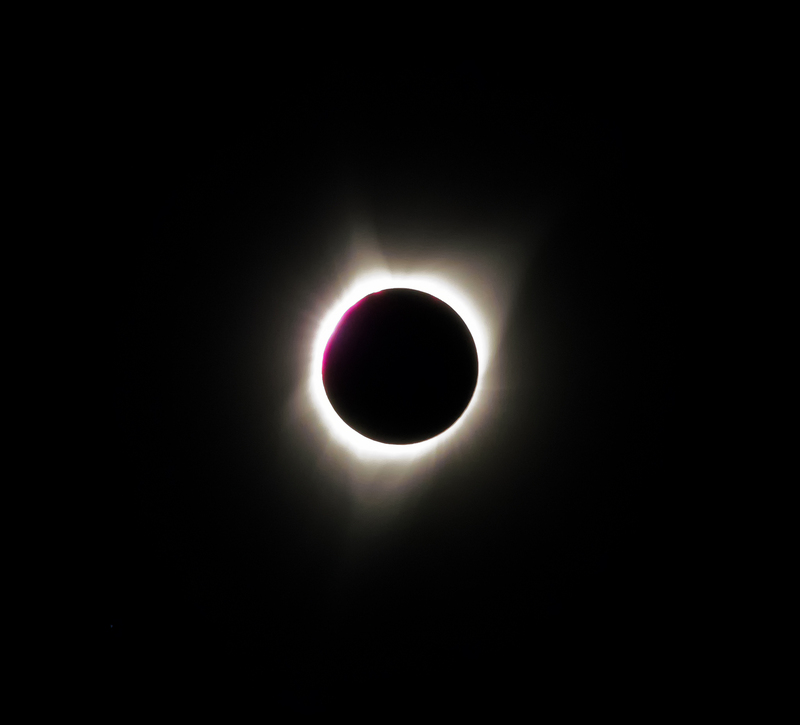 You let the camera drop to your side, your eyes unable to peel themselves away from the majesty of totality. It’s not until you hear others mention the stars that you finally turn away from the sun and view the rest of the sky, now sprinkled with glowing balls of light at 10:18 in the morning. The hilly rows of vines stretch into the distance under a starry sky. Then it’s over. All of this has happened in less than 30 seconds. The diamond at the edge of the eclipsed sun grows brighter and you know it’s time to put your glasses back on. Light returns to the sky almost instantly–but it’s not daylight–instead you’re faced with a strange twilight. You remove the glasses and turn your sights away from the sun and toward the countryside, which now seems to be bathed in a neon glow. You snap some more photos then sit back and take it all in. You still can’t believe what you just saw and you find yourself wishing for more, somewhat regretting not traveling further south to experience more totality, but also grateful for being among the privileged few humans on Earth to have witnessed a total eclipse of the sun. You wonder what the ancients must have thought when they saw such an event. Did they think the world was ending? That a deity was coming down to strike vengeance upon the wicked? Gradually, full daylight returns to the valley. You pack up your picnic spread and head back to the winery. The moon will continue to eclipse the sun for another hour or so before it moves away and resumes its eternal dance with the Earth, but the show is essentially over. The phase of totality now feels as if it happened in another life to another version of yourself. Nevertheless, you are hooked. You know that you’ll be chasing the next total eclipse to hit North America in 2024, and perhaps others around the world in the years beyond, just to get that feeling again, that indescribable sensation of existing among the cosmos, if only for a moment.